Straight from the Dragonfish stable the arrival of Smooch Bingo launching in October 2012. It is a bingo site that won’t kiss you goodbye instead shower you with lots of affectionate smooches. It’s guaranteed to offer you amazing Jackpots and a peck on the cheek for good luck! If you are an avid Bingo player you know what treats you’re in for at Smooch Bingo. Dragonfish has taken the bingo community by storm and showered players with goodies and plenty of riches. Smooch Bingo landing page is not necessarily what you thought it would be filled with x’s and o’s and big red lips blowing kisses at you. Instead like a kiss it makes you feel happy with a warm inviting look and feel. Flanked in blue and pink one can help but think of “first comes love, then comes, marriage, then comes baby in a baby carriage”. Blame it on the “Smooch” name and it all comes together. The countdown clock ticks away for the start of the next bingo game and if you are quick about it, because won’t miss out and may find yourself among the Latest Winners list that are very impressive wins. The latest Jackpots are splashed across the homepage brimming with a treasure chest of cash tempting your bingo pleasures. Smooch Bingo abides by the laws and is licensed to operate in Gibraltar. Sometimes less means more but that way of thinking doesn’t apply at Smooch Bingo because more means better. That is exactly what you will find with an enormous platform of games to choose from. Your main course may be Bingo but you will stay for dessert for incredible Slots. Add spice to your bingo game with 90, 75 and High 5 Bingo with 24 random bingo cards displayed in the bingo room. If you want a new batch of cards no problem simply click on the Get New Cards and choose the auto number of cards you want that are grouped in 6 at a time. Autodauber and manual dabbing is available by simple clicking on each card. Bingo winners are automatically recognized by the server. 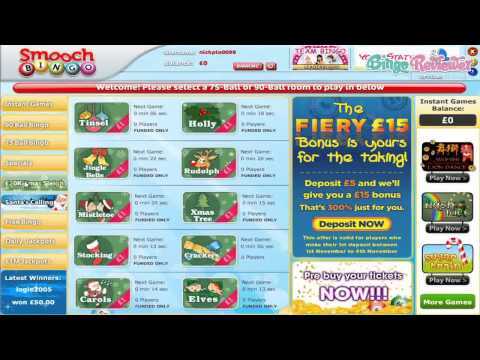 Play Instant Games in the Smooch Bingo rooms simultaneously or by accessing them in the lobby. Games include a broad array of options including Blackjack, Roulette, Video Poker, Slots and Instant Win Games. Besides quality gaming bingo players are looking for two very important things; Freebies and amazing Jackpots. Smooch Bingo is definitely kissable when it comes to both of these. How does £6,000 a month in Free Bingo sound? Free Bingo rooms are offered to both funded and non-funded players reaching every type of player. The Best Friends Forever Loyalty program is your bingo spa of spoiled players. You will enjoy luxuries like Cash-Back on losses, Re-Deposits and Special Promotions not offered to other players. Play and earn Loyalty Points every time you do and double them during Happy Hour. Give a shout out to your bingo buddies to come join and a sweet Bonus is waiting for you. The Newsletter has the newest promotions available to fill your days and weekends with load of ways to scoop up big cash. Who knows you may just be the next millionaire or big Guaranteed Jackpot winner in one of many daily scheduled Coverall games. Smooch Bingo is one site i like to kissy kissy up to. Fairly new to the online bingo community i joined there shortly after they opened. The have added an exclusive Singles bingo room that is a blast for players looking for romance. They award dating prizes and there is lots of fun blushing flirting going on! Its a Dragonfish powered site so you pretty much know what the promotions are like as they are the same at most sites. But the Single Bingo gives Smooch Bingo an exclusive touch that stands apart from the rest. There are three different versions of bingo to choose from when you play here, which I was very pleased to see. They offer the classic 75 and 90 Ball games, plus an exciting addition with High 5 Bingo. I don’t mind seeing the classics over and over, as long as you can throw me something different every once in a while and that’s just what this High 5 Bingo does. It keeps things a bit more interesting. They have fantastic Coverall and Progressive giveaways daily that you must take advantage of. There is so much cash to be won! They also provide you with a number of Slots complete with awesome features that are sure like free spins and bonus rounds. Popular games include Bejeweled, Cleopatra and Temple of Isis. Exciting Mini Games are also available can be found as well. Overall I really enjoy the site and they offer some really fun promotions with even more ways to have fun and win cash. I recommend it to anyone. With 20 pounds up for free on your first deposit, you'll be ready to play and call Bingo right from the start here at Smooch Bingo. This non US friendly site, but maybe someday, is a Dragonfish powered site so you know you can trust your transactions and your information and that your games will play smoothly and be tons of fun. Play 75 ball, 90 ball, or the always fun high five bingo here, and also be sure to grab some buddies and get in on the very rewarding team bingo action. Be one of the top teams and win big each month. You can also play slots here like Monopoly, X Factor, Bejeweled, and all of your other dragonfish favorites. With great Coverall and Progressive jackpots, there are some huge prizes out there just waiting for you to win them. Play the mini games and be sure to participate in chat. Also join the facebook page to get in on more and more promotions and prize action. Great things are happening at Smooch Bingo and you should be in on all the action here. Oh, and don't miss that action in the singles bingo room where you never know, you might find a partner for life! How exciting would that be to say you fell in love at Smooch Bingo? The site looks a bit too colorful for me, but hey, it is cheerful and it is very fast to navigate, and that's got to count for something. I have recognized a Dragonfish site, and have seen some of their promotions elsewhere, but new players do get a decent sign up bonus, up to 200% on your first deposit of at least £10. Still, I wish there was a No Deposit Bonus that I like to use to explore the site further. Although the site has a bingo in the title, there is a lot more to find, and you can play a few other popular games, a nice addition if you like Dragonfish software. The bingo is covered with 75 ball, 90 ball and High 5 Bingo that is very popular, and with a good reason, you get fast paced games that are easier to concentrate on.